Richard Kessler stands on what will become a rooftop bar atop his new $275-million development beside the Savannah River. Below, shops and restaurants on River Street are beginning to open on a sunny morning. His Plant Riverside District in Savannah includes the adaptive reuse of a dormant power plant and new buildings with a total of 419 hotel rooms, ballrooms and meeting spaces, a concert venue, retail and restaurants, and a 488-car parking deck. The project is expected to create 700 jobs. A few minutes later, a massive container ship glides past, but even larger ships are expected as the Port of Savannah completes its $1-billion expansion. The port helped drive $500 million in private investment and 1,906 jobs to Chatham County in 2018, according to the Savannah Economic Development Authority (SEDA). From the historic district to Interstates 95 and 16, projects are changing the county’s look and economic climate, while homegrown entities that now have a global footprint, such as the Savannah College of Art and Design (SCAD), celebrate milestones. Roughly $1.5 billion in construction projects are happening in Savannah, says Mayor Eddie DeLoach. More than 13.7 million visitors spent a record of nearly $3 billion in 2017, which Visit Savannah expects to see grow this year, Marinelli says. And there are more upscale accommodations for them. A West Elm-branded hotel with more than 150 rooms across from Forsyth Park will open soon along with a 103-room Cambria in the historic district and a 55-room Lark Hotels at Bay and Habersham streets. The Savannah Marriott Riverfront completed a $20-million remodeling project. The Savannah/Hilton Head International Airport is seeing affluent travelers from cities such as New York, Boston, Chicago, Miami and Toronto due to more nonstop flights, Marinelli says. Many are drawn by accolades from other publications, including Travel + Leisure magazine, which named Savannah to its 50 Best Places to Travel 2019 list. In January, Allegiant airlines announced new nonstop routes from cities in Pennsylvania, Michigan, New York and New Hampshire. Frontier Airlines added round-trip flights to Denver and Philadelphia in 2018. All of which adds to record arrivals and departures. 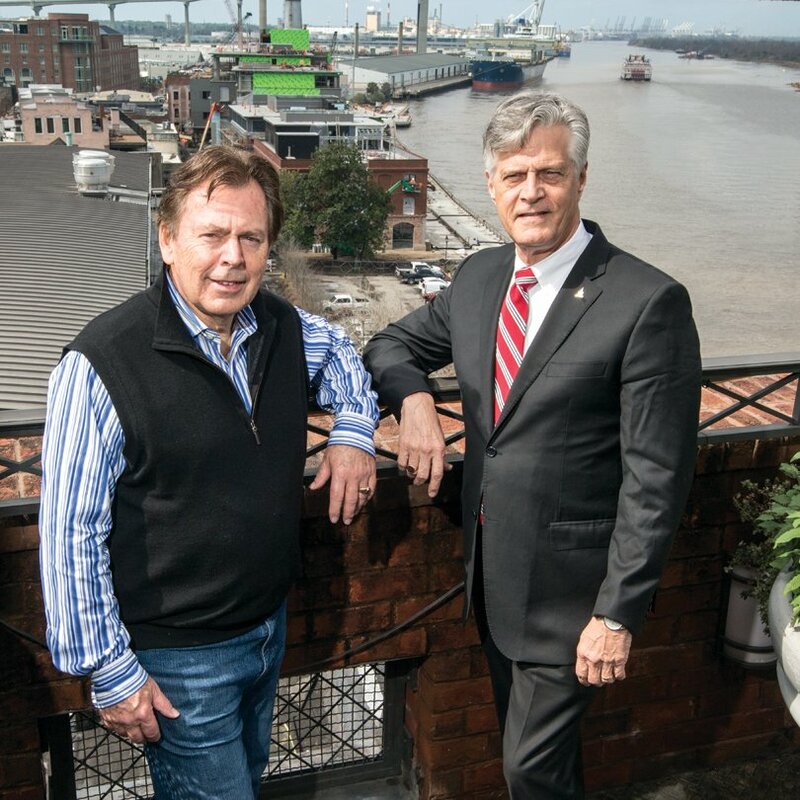 “We’ve got more direct destinations than we’ve ever had before,” says William Hubbard, president and CEO of the Savannah Area Chamber of Commerce. And to feed all of these arrivals, new restaurants include LaScala Ristorante, a $2-million renovation of an 1890s mansion. The owners of the acclaimed The Grey opened a combination Southern lunch counter-style eatery and New York-style bodega called The Grey Market last year. The legendary Olde Pink House is scheduled to reopen this month after a fire in December. Shops such as 24e Design Co., with home décor from around the world, share in the revitalization of Broughton Street. Daniel G. Carey, president and CEO of the Historic Savannah Foundation, says most people would say Broughton Street is more vital now than it’s ever been. “I think it’s reflective of the overall economy of Savannah,” he says. One challenge, he says, it that there is little property left in Savannah’s National Historic Landmark district. Developers need to earn a return on their investment without damaging the area’s integrity, scale and character, he adds. One development that’s done that is the 167-room Perry Lane Hotel, a boutique hotel that opened on Drayton Street last year. Perry Lane grew up on the site of a couple of parking lots, and was called one of the “world’s hottest new hotels” of 2018 by Forbes magazine for its nod to historic Savannah mansions, while also providing modern amenities today’s travelers expect. “That’s a case where you can say, ‘the old and the new work well together,’” Carey says. Hotels are also contributing to the economy in other parts of the county. A Home2 Suites by Hilton Savannah Airport opened in 2018, and three hotels are under construction in Pooler, says Pam Southard, executive director of the Pooler Chamber of Commerce and Visitors Bureau. The chamber, which has 427 members, plans to move this spring into a renovated 1800s home across from City Hall on U.S. Hwy. 80. “You have the modern and the new [on Pooler Parkway], and then you can go back and revisit the [Pooler] historic district and see what we have to offer down here,” she says. New things are happening all over the city of Savannah and throughout the county. Savannah’s West Downtown Opportunity Zone offers job tax credits to spur economic growth. Kessler, for example, expects to hire about 700 people for his Plant Riverside District, which is located in the zone. The project, the largest redevelopment in the city’s historic district, according to Kessler, is expected to generate about $55 million in city and county taxes over 10 years and an economic impact of about $115 million. “We’re hoping that other projects follow suit,” says Trip Tollison, president and CEO of SEDA. On the other end of River Street from Plant Riverside District, a mixed-use development called Eastern Wharf (formerly Savannah River Landing) represents a big piece of growth, Hubbard says. Developers broke ground last fall on the $200-million first phase of the 54-acre site that will feature parks, greenspace, shops, restaurants, hotel rooms and waterfront residences. Also this year, the city plans to begin construction on the $140-million, 269,000-square-foot Savannah Arena, part of the larger Canal District development west of Forsyth Park. Savannah’s port, which is the fourth busiest in the nation in traffic, is halfway through a project to deepen the harbor to allow for larger container ships. The GPA is also building the $126.7-million Mason Mega Rail Terminal to double capacity to 1 million containers per year. The whole operation combines to create the fuel that keeps the large manufacturing, logistics and distribution part of the economy in this region humming. In Pooler, the state is expected to open its fourth Quick Start training facility, a $17.6-million investment focused on advanced manufacturing, this winter. The 50,000-square-foot building is on the Pooler Megasite at I-95 and I-16, just north of Savannah. The facility will house the equipment and space to train people in welding, mechatronics, industrial technologies and more. This year could see the start of projects to widen I-16 to six lanes from I-95 to I-516 and reconstruct the I-95/I-16 interchange to enhance flow and improve safety while accommodating the growing traffic from the booming port. Just off I-16, SEDA’s new 719-acre Savannah Manufacturing Center, an industrial park geared specifically toward the manufacturing sector, is ready for development. Later this year, Gulfstream Aerospace Corp. plans to open a 202,000-square-foot service center at the Savannah/Hilton Head International Airport and create 200 jobs. The $55-million project will give Gulfstream more than 1 million square feet of customer-support space in Savannah. Wayfair, an online home decor retailer, is scheduled to open a warehouse this month. The new 1.1-million-square-foot facility represents an estimated $45-million investment and 1,000 jobs over the next five years. “All parts of our economic engine are firing well, and it’s diverse,” Hubbard says. History, art, architecture and now film all help define the creative culture that makes Savannah such a vibrant place to visit – and set down roots. The cultural scene is celebrating milestones in 2019. Telfair Museums, under the leadership of new Executive Director and CEO Robin Nicholson, formerly with The Frick Pittsburgh, is hosting events for its 200th anniversary. The Savannah Cultural Arts Center, with its theaters, classrooms, gallery and studio space, is expected to open this spring. And SCAD is celebrating 40 years of educating artists and redefining the city’s landscape. Creativity abounds in the business sector as well, in spots like designer Emily McCarthy’s eponymous shop in the Starland District that sells colorful gift and paper products for home decor and entertaining. She opened the storefront in 2016, alongside boutiques, galleries and eateries in the revitalized district. McCarthy says her Abercorn Street location is accessible to locals and tourists, who come from around the country. A highlight of that creativity is the film and entertainment industry, which nearly doubled its economic impact to $253.6 million from 2017 to 2018, according to SEDA. A total of 208 professional productions were filmed in the area, including Gemini Man, starring Will Smith. There is heightened awareness about flooding in Savannah and on nearby Tybee Island after a 2018 federal report on climate change was released and following recent hurricane evacuations, says Nick Deffley, Savannah’s environmental services and sustainability director. A partnership between Savannah, the Chatham Emergency Management Agency and Georgia Tech is installing sea level-rise sensors to receive real- time updates and identify high-risk points. A repaving project will raise Hwy. 80, the only road on and off Tybee Island, to fend off “sunny day flooding” during high tides, says Tybee Mayor Jason Buelterman. He adds that Tybee is also working with the Georgia Department of Transportation on a $112-million project to help replace two bridges and widen the causeway. “That’s a big public safety issue and a convenience issue,” he says. Tybee will receive $13 million in U.S. Army Corps of Engineers funds for a beach renourishment project that will help build up dunes. The island has nearly 3,000 full-time residents, Buelterman says, and 64 homes that flooded during recent hurricanes. He is seeking state funds to have those homes lifted out of the way of future flooding. Flooding and hurricanes aren’t just a problem on Tybee, however. Savannah has also experienced significant damage from hurricanes, and many areas are prone to flood. To help mitigate stormwater impact and flooding, a partnership with the University of Georgia Center for Urban Agriculture is using a $230,000 Southeast Sustainable Communities Fund grant to place trees on vacant city lots. Almost 60,000 students are enrolled in the area’s 19 universities and colleges, according to SEDA. SCAD expects record enrollment this fall with more than 14,000 students across its campuses in Savannah, Atlanta, Hong Kong and Lacoste, France. Georgia Southern University’s Armstrong campus had 5,610 students in fall 2018. The campus offers more than 50 majors, and its Water’s College of Health Professions educates more undergraduate health practitioners than any other Georgia institution. That’s great news for Memorial Health University Medical Center, a 612-bed facility that was acquired by the private HCA Healthcare for $456 million last year. The Pooler campus of St. Joseph’s/Candler was also hiring healthcare graduates to care for patients following an expected March opening. Savannah is using a $300,000 EPA brownfield assessment grant to identify and clean up blighted sites along the Martin Luther King Jr. Boulevard and Montgomery Street corridor. Savannah State University students will gain living-lab experience on the project that could identify catalyst properties for startups and create jobs on redeveloped sites in that corridor, Deffley says. Savannah also has programs in place to help keep younger kids in school – and out of the judicial system. In December 2018, The Front Porch opened as a multi-agency resource center serving at-risk youth and their families. The facility, a collaboration of the school district, judicial system, police and community organizations, will be a one-stop shop for mental and physical health services, follow-up and early intervention, with the idea of keeping at-risk kids out of the juvenile justice system, DeLoach says. And for these kids – and others age 16 and up – the mayor’s Summer 500 Youth Employment program, a public-private partnership, offers eight weeks of paid summer jobs in areas including arts and recreation, financial services, manufacturing and more. “If I ever got anything I want to be remembered by, it’s Summer 500,” DeLoach says. It’s not the only public-private education partnership in town. The Savannah-Chatham Public School System in 2017 established The Kessler Hospitality Program. Kessler says his company made a $600,000 investment to build model hotel rooms at Woodville-Tompkins Technical & Career High School. The program provides training and jobs. It’s a perfect fit in an area where the tourism market employs more than 28,000 people. •Savannah is spending $20.5 million on a new biosolids drying facility, an upgrade to its wastewater treatment plant on President Street that is expected to open this spring, and an estimated $38 million to upgrade a wastewater treatment facility. • JCB Americas Inc. landed a $142-million contract from the U.S. Army for more than 1,600 light-capability rough-terrain forklifts in 2017. Last year, the company brought production of its 505-20TC Loadall compact telescopic handler to Savannah. • After 10 years, a new $4-million Tybee Island Marine Science Center is in the works on the north end of the island. Gardens and the water – two integral areas of Savannah’s past and present – come together at the Ships of the Sea Maritime Museum. The nautical-themed museum and its surrounding garden in downtown Savannah are on the grounds of the 200-year-old Scarbrough House, a national historic landmark that was home to William Scarbrough, a prominent citizen. The museum has major reasons to celebrate in 2019. It’s the 200th anniversary of both the construction of the Scarbrough House and the voyage of the SS Savannah, the first steamship to cross the Atlantic. Scarbrough was one of the ship’s principal owners, and the crossing bridged the age of transport by sail to the age of transport by steam, Adler says. Painstakingly detailed educational ship models, paintings and the garden bring 25,000 people annually to the museum, which opened in 1966. The building was also once home to the West Broad Street School, one of the first black public schools in Georgia. The collection of scale models in its nine galleries includes the Anne, which brought the first colonists to Georgia, the SS Savannah and the Titanic. A current campaign seeks to upgrade the exterior south porch to display Russian cast iron furniture obtained by Capt. Moses Rogers on the Savannah’s crossing in 1819. The museum’s location on Martin Luther King Jr. Boulevard, near the Plant Riverside District, places it in proximity to take advantage of more visitors to the west side of downtown. The Scarbrough House and its garden – the largest private garden within the historic district, Adler says – often are used for public events, including the Savannah Music Festival, which runs from March 28-April 13.